Professional speaker, entrepreneur and literacy advocate Wally Amos talks about the importance of teamwork in business and failure as a means of achieving even greater success. He shares with us how he lost his first business venture, Famous Amos, which he put up in Hollywood in 1975. Mr. Amos worked as a theatrical agent at the William Morris Agency where he had initially demonstrated his adeptness in publicity and promotions. His latest endeavor, the Chip and Cookie Read Aloud Foundation, aims at developing and improving literacy aptitude of children. Chip and Cookie are plush character dolls pulled from Mr. Amos’ chocolate chip store of the same name. Find out more about his advocacy mission and why he has been chosen as one of 2004’s most of instrumental players in shaping Hawaii in an interview filled with passion, enthusiasm, and a sweet-tooth for chocolate chip cookies. Most people go through life as if they were living out the movie Ground Hog Day. One day at a time, same thing every day, never breaking the cycle. Then there are those people who wake up every day with a mission to live out their dreams and to inspire others to connect with their potential. 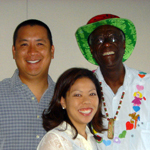 Wally Amos is one of those – a man with a mission. Born in Tallahassee, Florida, Wally Amos lived a childhood that was not always stable and trouble free. But as a child he had an innate spirit and gift to view the world with optimism. The most loving person in his life was Della Bryant, his aunt in New York City. At the early age of twelve, young Wally moved to New York to live with his aunt who assumed a parental role. She was also the first person to bake him chocolate chip cookies. Although the home was of modest means, it was abundant in the meaningful qualities that give a child principles, “a can-do” attitude. Wally Amos began his early professional career in the stock room at Saks Fifth Avenue. He worked hard but was consistently underpaid. He asked for raises but was denied. Not having another job in place, but believing he was worth more Amos left the stock room ready for the next thing. That turned out to be the entertainment industry. Just like at Saks, he started at the bottom. This time it was the mailroom at the William Morris Talent Agency. And just like before, Amos worked hard. At William Morris it paid off. Wally Amos rose from mailroom clerk to agent – the first African-American agent. He prided himself on his ability to find the next new thing. He was the first to book many of the top performers of that era including The Supremes, Simon & Garfunkle and Marvin Gaye. When he felt he’d gone as far as he could with William Morris he formed his own theatrical management agency. Packing up his young family he moved to the west coast. There were ups and downs but Amos always stuck to his principles: work hard, be positive, and don’t look back. Over the years the entertainment industry began to wear on Amos. Show biz personalities weren’t always the easiest people to deal with. It was time for a change. In 1975, long before there were “food personalities” like Emeril Lagasse, Paul Newman and Nigella Lawsohn, Amos came up with the idea that he could sell his cookies as an entertainment personality –a gourmet chocolate chip cookie. Borrowing $25,000 from friends, Amos opened the first freestanding store that sold only cookies: The Famous Amos Chocolate Chip Cookie store. It became the next big thing. Soon the entrepreneur became a national personality renowned not only for his cookies but for his ebullient and outgoing persona as well. It wasn’t long before Wally Amos expanded his business to other locations. To top it all off, Bloomingdale’s, America’s favorite department store began selling the cookies as its newest “must have” item. Famous Amos cookies became the “jet set cookie.” A new industry was born. In 1984, a series of events led the company to change hands. It is now owned by the Kellogg Company. Amos eventually returned to baked goods through Uncle Wally’s Muffin Company. Asserting that being famous only meant that lots of people knew who he was, Wally Amos always wanted to use his wide recognition as a means to draw attention to an important cause. That cause became literacy. Wally has dedicated his efforts to Literacy Volunteers of America where he served as the National Spokesperson from 1979 to 2002. As a literary advocate, Wally uses his well-known name to support educational causes and serves on the Boards of the National Center for Family Literacy, Read to Me International, and Communities in Schools, in addition to many others. Wally now has his own foundation, the Chip & Cookie Read Aloud Foundation which promotes reading aloud to children. He is the recipient of many honors and awards including the President’s Award for Entrepreneurial Excellence, the Horatio Alger Award, and the National Literacy Honors Award. He has been inducted into the Babson College Academy of Distinguished Entrepreneurs. Wally Amos is well known on the motivational speaker circuit and is the author of five books: The Famous Amos Story: The FaceThat Launched a Thousand Chips, The Power in You: Ten Secret Ingredients To Inner Strength, Man With No Name: Turn Lemons Into Lemonade, Watermelon Magic: Seeds of Wisdom, Slices of Life, and The Cookie Never Crumbles: Inspirational Recipes for Every Day Living. His most recent project is working with his wife Christine Harris-Amos who created Chip & Cookie, two dolls fashioned in the image of “boy and girl chocolate chip cookies.” As expected, the dolls are packed with personality and are accessorized with a clever storybook Wally Amos Presents Chip & Cookie: No More Chocolate Chips, a heart-warming tale chronicling the adventures of Chip and Cookie. Amos has re-entered the retail cookie business with Chip & Cookie in Kailua Town Hawaii. Please visit www.chipandcookie.com. For Amos it’s the next new thing.